These publications can be used for personal learning or as curriculum materials. Click here to browse them individually. The guides in this set will provide any reader with the core concepts and mental tools essential to a robust, ethical framework of critical thinking. Those looking to develop as critical thinkers, but who aren't certain where to start, would do well to begin with this classic collection of foundational ideas. Meanwhile, the set is perfect as reference material for even the most seasoned reasoners. Our guides are written so that any reader, from any walk of life, can easily learn - and begin utilizing - the information within to enrich his or her education, work, and life. At the same time, these guides are designed to be excellent curriculim materials for faculty and schoolteachers looking to foster fairminded rationality in their students, no matter what they are learning. 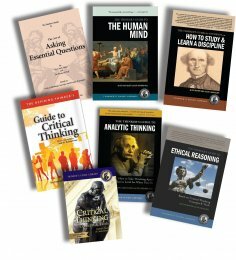 07SET Core Set of Critical Thinker's Guides $79.95	 Qty.